There is no excuse for the community to let this problem continue [click on link above!]. Watch the video about the cemetery. The Superintendent may have his hands tied with lack of funds, but recruiting volunteers should not be that hard. A fund raiser would be a good way to generate enough money to hire someone to weed-eat around the markers. Where are the Boy Scouts or 4-H members who are great volunteers for this type of "Good Citizenship!" When I was Superintendent of the Evansville (Indiana) 2 city-owned cemeteries almost 20 years ago. 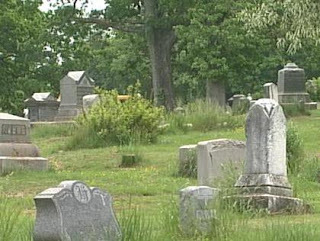 We had "work release" prisoners help maintain the cemeteries, along with people with minor legal infractions that needed to complete a couple hundred hours of "Community Service" as ordered by a judge. A civilized community can be judged by how well they respect their dead. Lawrence is proving to have very little respect for their dead. Sad, indeed!